The Cincinnati Bengals are releasing veteran George Iolka, who has started every game for the team since 2013, in a move to give second-round pick Jessie Bates an opportunity at immediate playing time and save them 6.2 million dollars. 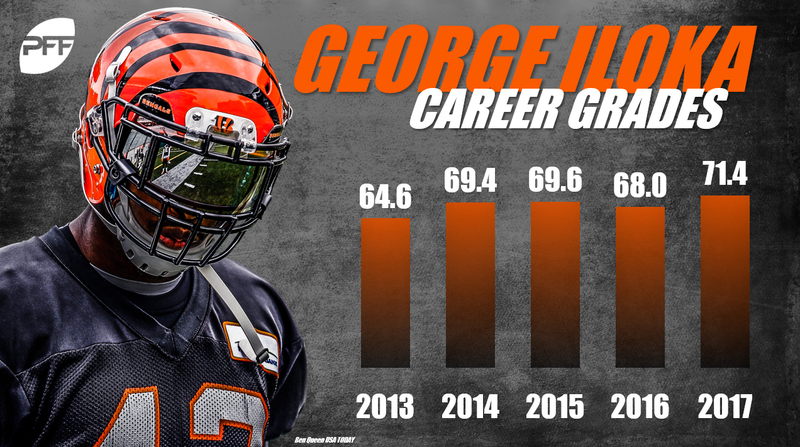 Iloka was in the third year of a six-year, $36-million deal signed in the 2016 offseason. This move appears to be a bit of a head scratcher on the surface – Iloka has been steady (if unspectacular) during his reign as a starter aftering being selected with a fifth-round pick out of Boise State. He has averaged roughly 0.34 wins above replacement the last five years, never generating fewer than 0.26 (2016) and never more than 0.53 (2014). He’s been reliable in terms of availability as well, playing more than 715 snaps each of those seasons, and eclipsing 988 snaps in four of those five years. While coverage grades paint a somewhat-incomplete picture for deep safeties, he’s surrendered fewer touchdowns (seven) into his coverage than he has interceptions (nine), and passers earned only a 68.4 rating throwing at him a season ago. The Bengals are also not exactly in a bind from the perspective of the salary cap, possessing over $15 million in cap space prior to this move. With former first-round picks William Jackson (worth over a win above replacement himself last season), Darqueze Dennard (0.62 WAR) and Dre Kirkpatrick ($9.57 million 2018 cap hit) seemingly the future at cornerback, and Shawn Williams earning a more-manageable $4.07 million this season, it appears that transitioning to a secondary featuring a solid core and Bates was more the reason for jettisoning Iloka than his price tag. When it comes to Bates, the rookie out of Wake Forest, it’s clear that the Bengals are a bit higher on him now than we were come draft time, where he was our 115th-rated player on our big board. His 16 missed tackles his final season are a reason for concern. However, in a league where versatility is becoming an increasingly-valuable trait on defense, Bates’ ability to play in the slot (34.3 percent of his snaps in 2017, versus Iloka’s 7.6 percent) and cover well there (allowing only a 72.0 passer rating) are certainly features in the Bengals’ decision-making process here. So where does this leave Iloka? 2018 was not exactly the best season for free-agent safeties, with Eric Reid and Tyvon Branch still looking for a job, and starting-caliber players like Tre Boston, Ron Parker, Kenny Vaccaro getting chances only after the offseason had grown old. Iloka is not as versatile as some of his contemporaries, playing almost 60 percent of his snaps a season ago at deep safety, but can no doubt help a team that has movable pieces at other parts of their secondary. Kansas City, for example, just lost Daniel Sorenson to an injury, has yet to see Eric Berry play a preseason snap off of an Achilles injury, and played three-safety dime packages 43 percent of the time a season ago. Seattle, with Earl Thomas still holding out, could be another option, as could a team like the Steelers, who could be growing impatient with Sean Davis in Year 3.